I wanted a break from my Mellerstain Parrots, so, instead of choosing one of the WIPs from my list, or one of the kits from my list, I dug in my drawer and found something else completely! 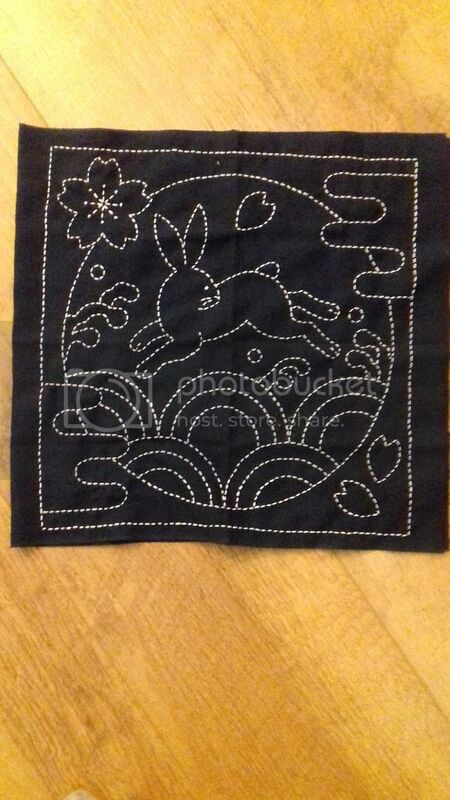 I bought this little Sashiko panel at the Knitting and Stitching Show in Harrogate back in November. Having finished it by the start of March must be some kind of record for me! I bought it from the Japan Crafts stall, you can buy it here. 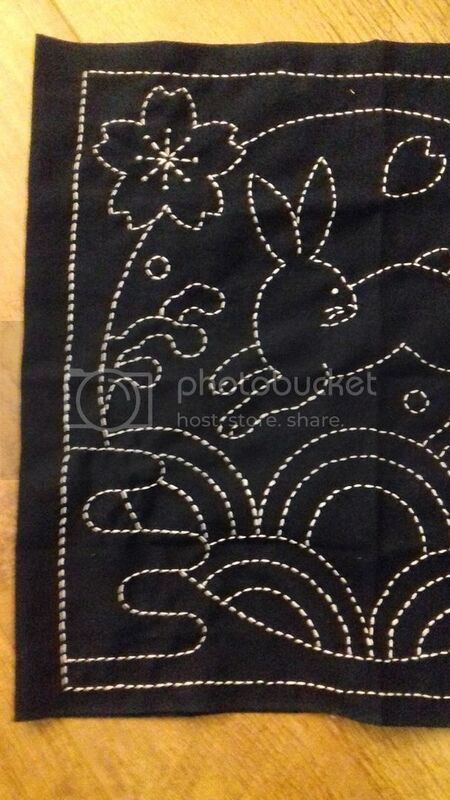 As I had Sashiko thread and needles at home, I just bought the panel. I think mum bought a kit of one of the other designs, I'm sure I'll come across it when I get round to sorting out more of her stash. Anyway, it only took a few evenings. I took a photo before I began of the pre-printed fabric, but it disappeared from my phone. As the lines were marked in white, I had to be careful to cover them completely, but I still found stitching it very leisurely using the technique of loading my needle with several stitches before pulling through. My stitches are far from perfect, but I'm happy with it. Now just to decide what to do with it - probably a cushion. Oh that's lovely. Very you! Very nice! I like those preprinted panels and agree they are good for some leisurely stitching. I made one into a bag and several into table runners. Maybe I'll try a cushion next time. Very neatly stitched Wendy! And another finish, Wow! I was just thinking that your stitches are perfectly sized and spaced and then I read that you think they aren't perfect ;)! I think you are too hard on yourself. Anyway, it looks lovely and I'm glad you enjoyed the stitching part! It's lovely and has a bit of a retro 1970s feeling to me (Crystal tipps and Alistair spring to mind). It will make a brilliant cushion centrepiece. It's charming - and a good change from the other piece! This is lovely Wendy, it will make a really great cushion. Sashiko is a great technique and I just love that stall! You've done a great job on that panel, love the fact that it's a fusion of japanese and folk art in design. That is adorable - and so perfectly "you"!! !